Saturn can be a difficult planet, ruling restrictions and limitations and where we need to be responsible, so his placement in the composite chart can show areas of difficulty in the relationship. With Composite Saturn in the 1st house, this can be a relationship that feels very limiting and restricting for the both of you. You may feel you have more responsibilities within the relationship, and it can be overwhelming. You have to be completely and totally mature and responsible in this relationship in order for it to work, otherwise you can have too many difficulties. If you can do that, this can be a relationship that endures. Want to learn more about love and astrology? Sign up for the mini class, Intro to Love Astrology! With Composite Saturn in the 2nd house, you can feel you have more limited resources and wealth in this relationship for some reason. In a personal relationship, you may struggle to handle finances properly together, and you need to be more fiscally responsible. In a business relationship, this can go either way, and it can make it more difficult for you to be financially successful together, but it can also make you work harder and create more wealth for you down the road together. With Composite Saturn in the 3rd house, communication can be difficult, and you may not feel like you can be completely open with one another or have difficulty understanding each other. You have to focus on opening the lines of communication, and allowing one another to express yourself fully. Continually working on improving your communication may be required, and without it, you just can’t see eye-to-eye. 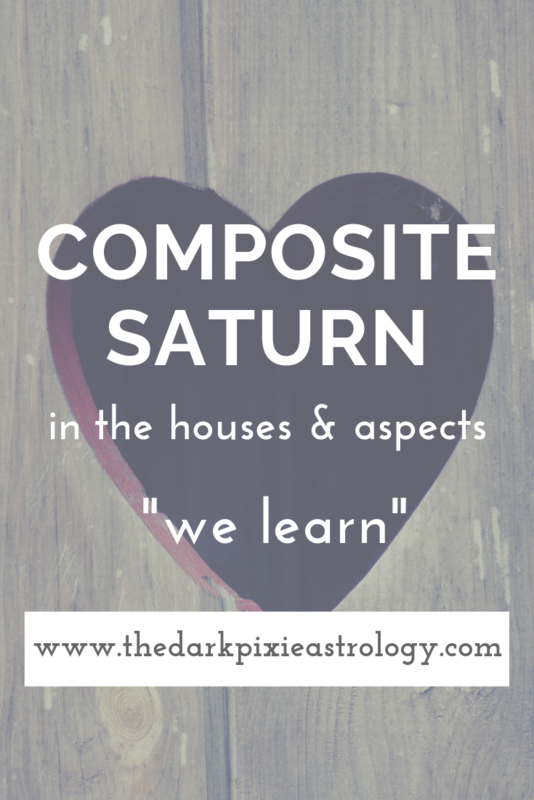 With Composite Saturn in the 4th house, this can be difficult in a personal relationship where you live together, or in a family relationship since this house rules the home and family. You can find it difficult to create the kind of life together that you envision, and may have different ideas of what that means. You need to be on the same page if building a life together. If a family relationship, you need to work on not being judgmental of one another. With Composite Saturn in the 5th house, you can have a hard time expressing the love you may feel for one another, if this is a personal relationship. In a business relationship, you can take things more seriously together but may lack creativity. This can be a difficult position for a parent-child relationship since this house rules children; the parent may be distant, or the child rebellious until they get older. If this pairing is trying to have children together, there can be delays and difficulties. With Composite Saturn in the 6th house, you each may feel that there is a tremendous amount of work that has to be done on a daily basis for the relationship. You may nitpick the partnership to death, making it difficult to survive, so you have to avoid that. In a professional relationship, this house does rule work, so you can find it more difficult to work together or find that you have greater focus and discipline together. With Composite Saturn in the 7th house, this is the house of relationships and so it can go either way. Saturn can help to strengthen your relationship placed here, and help the relationship endure. But he can also make it more difficult for you to treat each other with respect, create disharmony, and make you feel unbalanced together if you’re not focused on the same things and both taking an equal share of the responsibilities in the relationship. With Composite Saturn in the 8th house, you may struggle over control of the relationship and over one another. You may not say anything though, which can lead to resentments, and you each may bottle up any bad feelings you have until you explode. You have to make a conscious effort to understand one another deeply, and to transform yourselves and the relationship together to help you grow. With Composite Saturn in the 9th house, you may find that you’re not as optimistic together or about the relationship, and you try to be more realistic. This may make you feel less joy in the relationship though, and you can feel quite restricted and limited, unable to expand your lives together or have enough space within the relationship to do your own thing. You need to find a balance between optimism and realism, expansion and limitation. With Composite Saturn in the 10th house, this is the house Saturn naturally rules, so it can be a little easier than the other placements. You do have to work on pure Saturn energy together though, and make sure you’re being responsible, disciplined, and ambitious together. You can help one another reach a common goal, and you can see the direction you’re going in together if you stay on the same path. With Composite Saturn in the 11th house, you may feel that this relationship doesn’t allow you to be your quirky self as much, give you much independence, or help you to achieve your dreams. You may feel you need to be more realistic about your dreams because of this pairing. You may also feel that you have less friends or spend less time around other people, and have to make an effort to not cut yourself off from others. With Composite Saturn in the 12th house, the old issues and baggage that each of you has can be a bigger issue in this relationship. You may feel that it overwhelms you together, or you don’t want to deal with it at all. If you can work together, you can help each other to move on from past issues, but you have to avoid leading to your own undoing, which may seem like more of a possibility with this person. With Composite Sun conjunct Composite Saturn, this is a relationship that can feel limiting and restricting, that comes with more responsibilities and duties, but this aspect can also work to keep you together and strongly committed to one another. This may be a bad thing if you’re not good for one another, but it can be a good thing if you are good for one another so you stay together through the rough patches. With Composite Sun sextile or trine Composite Saturn, you can be more mature and responsible in the relationship, and this can be a very stable relationship. The conjunction, sextile or trine can all be beneficial for business relationships. With Composite Sun square or opposite Composite Saturn, you each may find that the relationship is too limiting and restricting, suffocating you. The responsibilities may overwhelm you, or you’re each too afraid to take steps necessary. These aspects can lead to a lot of conflict, so you have to manage the weight of the relationship. With Composite Moon conjunct Composite Saturn, this relationship may feel constricting and limiting emotionally. One or both of you may feel that you can’t express what you feel for one reason or another. One or both of you may feel you have too much responsibility in this relationship, which can overwhelm emotionally. This aspect can help you to maintain stability and commitment, but you have to allow one another to freely feel. With Composite Moon sextile or trine Composite Saturn, this can be a stable relationship emotionally, and you each may be more practical and responsible. With Composite Moon square or opposite Composite Saturn, it can be difficult for you to be on the same page emotionally. One or both of you may be distant and cut off emotionally. The conjunction, square, and opposition can be especially difficult when this is a family relationship, especially with an elder/child relationship. With Composite Mercury conjunct Composite Saturn, communication may be difficult in this relationship. One or both of you may feel that you can’t open up completely, and this inhibits free communication. You have to work on opening up about your thoughts and ideas in a way that’s responsible, mature, and disciplined. With Composite Mercury sextile or trine Composite Saturn, communication between you can be calm, measured, and focused on what’s important without any of the filler. With Composite Mercury square or opposite Composite Saturn, communication can be extremely limited or completely cut off, and you don’t know how to talk to one another. You may feel judged by the other person, and hold yourself back from speaking. More openness is required. With Composite Venus conjunct Composite Saturn, you can stick together and feel qute committed to one another, but the ability to express your feelings and show affection may be limited in a personal relationship. You have to work on allowing one another to be more expressive with your feelings. This can be a better position in a professional relationship, and you can work hard together toward a common goal. With Composite Venus sextile or trine Composite Saturn, this can ring stability to the relationship, and you each can be more mature, responsible, and measured. With Composite Venus square or opposite Composite Saturn, the relationship can feel very constricting and limit each of you in some way. You may feel a distance between you, and outward expressions of love can be nonexistent if you don’t out a conscious effort in. With Composite Mars conjunct Composite Saturn, the relationship may be lacking energy, or you can feel you lack energy and drive with one another. This can lead to frustrations, but you may try to hold it in and that only leads to bursting later. You need to be more disciplined and in control of yourselves with one another and within the relationship. With Composite Mars sextile or trine Composite Saturn, you can be cautious in your approach, make more plans, and take more time to do things, wanting to be sure of yourselves together and when working on the relationship. This can be stabilizing energy, but you still need to allow one another to be open. With Composite Mars square or opposite Composite Saturn, you may feel like you just can’t work together whatsoever, personally or professionally. You may each want different things, and you have difficulty getting on the same page or agreeing on the direction to go in. If you don’t have that, it’s difficult to get along. With Composite Jupiter conjunct Composite Saturn, balance is required in order for this relationship to work. You must strike a balance between expansion and limitation, optimistic and pessimism, recklessness and cautiousness. If you can find the middle ground, this can be a strong relationship that works and lasts. With Composite Jupiter sexrile or trine Composite Saturn, finding that balance can be easier between you, and you try to strike the right notes in the relationship. With Composite Jupiter square or opposite Composite Saturn, striking that balance can be much more difficult, and you can be too expansive and reckless or too cautious and restricted. With Composite Saturn conjunct Composite Uranus, it can be difficult for you to balance stability and change together, and you can find the relationship to be too stable and boring or too erratic and unpredictable. This can lead to a lot of fighting if you don’t try to use both energies. With Composite Saturn sextile or trine Composite Uranus, you can balance them more easily, and this can help you to stay together through whatever comes, making changes when required and being cautious when required. With Composite Saturn square or opposite Uranus, this can lead to too much instability in the relationship, or make it so that things never change at all. You can get stuck one way or the other, and need to find that balance. With Composite Saturn conjunct Composite Neptune, you need to combine practical energy with whimsy, the tangible and the spiritual, the real with the imagined, and this can be difficult to do. In the best of cases, you can help one another to make your fantasies reality. With Composite Saturn sextile or trine Composite Neptune, you can find it easier to balance the two opposing energies. With Composite Saturn square or opposite Composite Neptune, it’s more difficult to balance the two, and you can be overly unrealistic or overly fearful, too cautious and constantly worried about one another or in the relationship. You have to not go to extremes. With Composite Saturn conjunct Composite Pluto, this can show that you have to go through a trial in order to stay together, or that you’re constantly battling against the messes of life and it tests you together. It can help you to become more bonded, or it can drive you apart. If you become more bonded, it can be a hard bond to break, which may be a bad thing if the relationship isn’t healthy. With Composite Saturn sextile or trine Composite Pluto, you can stick together through difficult times, support one another, and transform through what you go through together. With Composite Saturn square or opposite Composite Pluto, it can be difficult for you to stay together when the going gets tough, and you may not feel much of a bond to one another.